If you’re tech savvy, these calendars are for you. Digital calendars make it easy to link family members together with their schedules. 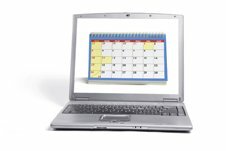 Calendars and schedules can be printed off when necessary, as well as accessed online, on a computer, or on a handheld organizer (PDA device). Computer Based Software - Personal organizer software must be loaded onto your home computer or laptop. Some programs have additional features, such as multi-user access, e-mail management tools, database management, and remote access capability. Online Based Calendars and Management Tools – Sometimes referred to as cloud computing. Benefits of this type of time management tool include multi-user access, e-mail management, and ability to store documents in a central location for easy retrieval by multiple users. Usually requires a small website subscription fee. PDAs or Handheld Organizers - Have the same features as other technology based calendars, with the added benefit of portability. Here you’ll find a variety of calendar devices and personal organizer software for sale.